Veteran Nigerian comedian, Basketmouth, has withdrawn his statement on the state of the nation, apologizing to former president, Goodluck Jonathan for disrespecting him, Daily Post reports. In his last Instagram post, the comedian debunked rumors that he was one of the advocates for the emergence of Buhari’s administration. He aired his stance on his alleged involvement in politics. He said he never campaigned for President Buhari or any other politician (including former president, Jonathan). He wrote: “Truth of the matter is that I would have voted anyone that could speak two words of English against Ex-president Goodluck Jonathan and that’s strictly based on the amount of greed and selfishness we witnessed from members of his (Jonathan’s) administration in the 6 years that he sat on the rock. 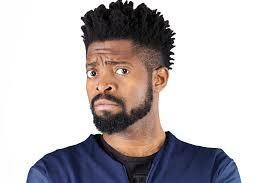 But barely 24 hours after airing his stance, Basketmouth apologized for appearing as though ‘disrespectful’ to Jonathan. He, however, retracted his statement, stating he has ‘nothing but respect’ for the former president. He wrote: “I have to sincerely apologise at this point that in expressing my opinion in my last post which was primarily to clear the air about who I campaigned, supported or rooted for or didn’t, I was disrespectful to a man I have nothing but respect. “The last President may have had some wrong advisers and consequently decisions were made that will eventually impact on the economy, however I am sorry if it came across as an attack on the man Goodluck Ebele Jonathan. “We all desired a CHANGE, majority voted for it, now we have it, it is definitely a process, a tough one because I know the hustle is real…believe me, I know. “I trust it can only get better, let’s just try to be patient,” he added.